Find the error ... or do not bother. Because the biggest mistake in New York, would want to find him a sense. New York is anything but rational, despite the appearance of its streets laid out in straight lines. Extravagant and unusual, it is made of these meetings that border on hallucination. New York is a huge surprise. Everything is possible, even her camels walk on 5th Avenue like other stroll their dog. No one, or almost no one takes the time to wonder. In the city of urgency, you have to live fast, take the train on and never stop. New York is constantly boiling, like those vapors that arose from the basement and which are part of the urban landscape. 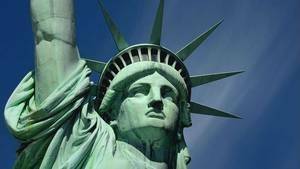 The firefighters, debonair embodiment of the American hero, the Jews of Brooklyn, familiar silhouette of the city-world, New York is made of these pictures. So photos that is provided at the same time, to be in full reality. And when the city shows off her giant balloons and marching bands, as expected at the time of the parade is to express its most true showmanship. Walking in Manhattan promises to unusual encounters: the dog-sitters working students against dollars canine, sandwiches and golden-men-boys on Wall Street swallowers hotdogs. It is to discover a city in perpetual motion where we run for fun, where you mix, again and again, in a rickety subway that is quite a trip. 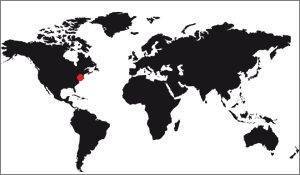 Here, the melting pot is a lifestyle. Because Manhattan is a world. A world apart. Tunnels and Bridges people know well that every morning tributary of the Bronx, Brooklyn or Queens, with the impression of coming from far away. In the country of free enterprise, the Manhattan buildings forest is a hymn to the audacity to challenge the imagination. 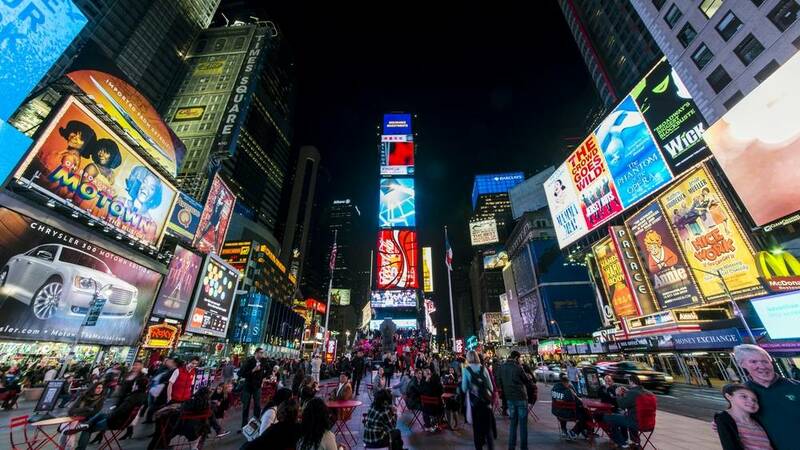 A New York saga, teeming and lyrical, which reads from top to bottom. A dizzying adventure that is beyond you, knocks you down, you submerge. Take the pedestrian walkway of the Brooklyn Bridge, suspended 40 meters above the East River reserve an almost surreal sight: The Manhattan Skyline appeared in a background blending the wind whistling in steel cables and rumble of cars that pass under them. Another site, another period: Wall Street on Sunday, it is a moment of pure happiness. Exit Dow Jones and brokers, the Exchange has closed like a shell. The most famous street in the world of finance, gutted, exudes serenity. Air opencast quarries paces. Coming from the sea, such as wind and gulls, light rushes through the streets of Wall Street. These narrow canyons at lunchtime, fill with thousands of employees cosmopolitan disgorge banks. In front of the Stock Exchange, the New York Stock Exchange, sanctuary of capitalism false airs ancient temple, a golden-boys crowd pressed toward the nearest grocery store. On the benches of the old cemetery of St Paul's chapel, some executives take a breather unpacking their sandwich. Built in 1766, the small church, crushed by buildings, is the oldest of New York. And one of the few examples of Georgian architecture. Wall Street, which becomes a market district in 1792, is nevertheless the historic heart of New York. This is where the first Dutch colonists settled in 1664, the thriving New Amsterdam was renamed New York. In 1835 a gigantic destroyed the last vestiges of the Dutch city. And De Witt Clinton, a visionary mayor, was then able to create the first "grid", a sort of cadastral plan that divides the center and north of Manhattan in 1928 rectangular blocks. One way to encourage real estate speculation, on which is founded in the nineteenth century the fortunes of Astor, Vanderbilt and Rockefeller. From 1880 these large families set their sights on 5th Avenue between 40th Street and Central Park, where they are building inspired mansions of old Europe. Since the end of gold-plated Avenue has retained the nickname "Millionaire's Row". Few houses have survived the eruption of the towers. In the interwar period this part of Uptown was the scene of a fierce race to the heavens. For thirty years the architects have already discovered the virtues of concrete and lift. Developments of Art Deco in Europe give them dreams of grandeur. And with the prosperity of the 20s, large American firms, to shine their name in the sky of New York finance their fantasies. It is first the Chrysler Building, refined anthem automaker, which in 1930 pierces the ceiling of the Skyline of its gargoyles eagle head and its shining aluminum arrow. Less high, the RCA Building manages to match it with the splendor of her sculptures that spring from her crown as radio flashes. A year later, during the Great Depression, General Motors Chrysler raising the Empire State, overwhelming gray column that will long be the tallest tower in the world. You have to climb to the top of the Empire to see the forest towers sinking into the twilight. The modest Flatiron Building in the shape of a bow, it separates 5th Avenue Broadway. In a rhapsody of lighted windows one can see the north silver bevel Citicorps Center, East Brooklyn cranes, west of the 28 buildings of Rockefeller Center, and beyond the Hudson, New fumes -Jersey. 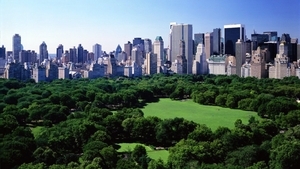 Naturalism Central Park, faithful to the English tradition of romantic landscape, had its effect. Yet it is illusion that this is, since everything here is artificial. Around the pools created using the original moorlands amount large gray houses like dead teeth, in the form of John Dos Passos. Sunrays pierce the foliage of maples. On the rocks overlooking the deserted meadow Sheep Meadow, two homeless awakened by the dew extract their sleeping bags. Squirrels have already started their mares to the strawberry fields of lawns, gardens for peace offered by Yoko Ono in memory of her late husband John Lennon, who was murdered on the opposite pavement outside the building where he lived Dakota. At this early hour, Central Park resembles Eden. Some silhouettes glide between trees. Every hour of asphalt roads that encircle the huge park are filled with a stream of joggers increasingly dense. They soon thousands, sweaty bodies pushed to their utmost limits that nothing seems able to stop, spit, in a giant mechanical and collective breath, the stress accumulated behind the glass towers of the megalopolis. Thousands foot, bicycle, wheelchair, rollerblade, or even cross-country skiing on wheels. Some, Walkman headphones on, dragging their toddler running in a sports stroller. It is as if the whole town merged in the same breath, as if the New York marathon, which ends at Central Park, was renewed constantly. At the end of the Mall, the long shady elm walk, that's another emotional release, another trance: a young rollerblades round slides on the pavement and sways to the rhythm of techno coming out of tablets new generations. A few yards away, in a small valley of greenery and rock, some forties whip the grass with their fishing rods as if they hoped to catch a trout. "We repeat the movements of the fly fishing with a line without a hook. It's easier in reality" fun practitioners who spend their lunch breaks to this unusual practice. 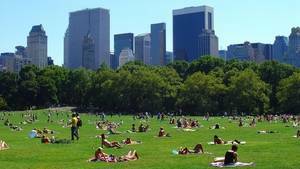 At 67th Street, on the vast lawn of Sheep Meadow, which is named after the lambs are grazed once, idlers have already unpacked their picnic. This is the meadow of relaxation: sports are banned there. People come here to hang out and count sheep floating in the sky of New York. 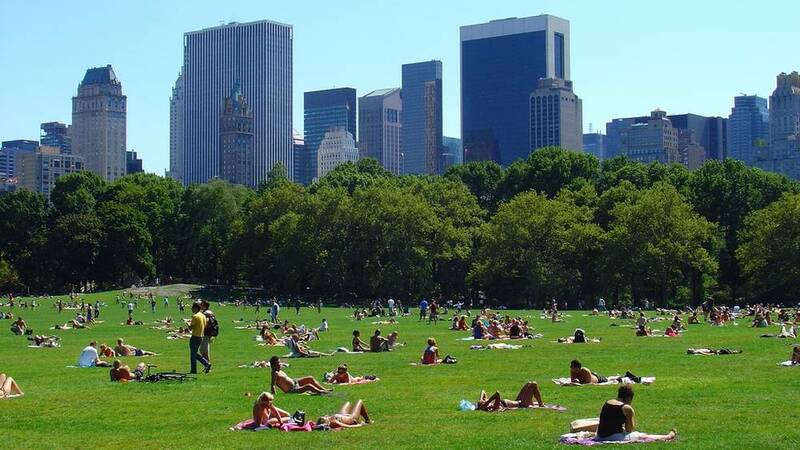 With her body half naked in the sun and spread its scent of herbs, Sheep Meadow looks like a permanent Woodstock. A world at odds with two squares of impeccable Green Lawn Sports Center that overlooks the meadow. In this conservative stronghold where some rich Mature share the joys of the English croquet and ball, white dress and rigor. Foreign and carefully held in check by a fence on which one can read "Permits holders only". Central Park is done well, spaces and people coexist at best be observed but generally ignore. And New York, Dustin Hoffman at small neighborhood grocer, just rest. Central Park was built between 1857 and 1873 to provide a relaxing space for all New Yorkers and especially the thousands of immigrants who crowded into slums. The 340 hectares then exceeded the limits of the city. For the rich project instigators this artificial green space had to compete with the parks they had visited in London and Paris. Both landscapers selected were true visionaries: Rejecting the classical European models, Frederick Law Olmsted and Calvert Vaux invented a game space that combines paths, lake, skating rinks and riding trails. Apart from the rocks, all in Central Park has been shaped by the hand of man: The hills, ponds, streams. Even the Ramble, a bushy undergrowth overlooking the extensive reed-fringed lake peaceful, and whose undulating roads are home to a world too perfect to be natural. As these woods Great Hill, just north of the park, almost desert, where forest of beech trees and clearings as alternate under the brush of a romantic painter. In the 70s this hill was one of the most dangerous places in New York, a den of drug dealers and crazy. Besides, it was Central Park as a whole had become a cutthroat. The decor "grated-buildings covered with graffiti lawns" reinforced the sense of insecurity walkers. Unable to cope with the maintenance, the municipality allowed the park to turn slowly wasteland. Today, although it is still not recommended to walk the night, the trend reversed. The most dangerous areas have been cleared and replanted, driving the population that nested there. The landscape has been revised, with the renovation of iron bridges Art Deco and neo-Renaissance fountains. It is in the north, near Harlem, the transformation of the park is the most spectacular. It contains the Conservatory Garden and presents French gardens, large rings made of chrysanthemums, an Italian garden and yew hedges and a mysterious English garden. A few steps away Harlem Meer, a large pond, was cleaned and dredged, its banks replanted. Its waters were repopulated and you can rent fishing rods in a building the appearance of a Norman manor. The park, which never ceases to be reborn, bustles with activity. We can organize regattas of miniature sailboats on the lake of Conservatory Water, playing Baseball, cool off in the room when the zoo penguins in August, the thermometer goes crazy, attend a free concert at Metropolitan Opera, or walk their pet ferret on lawns. For a moment, the attraction of this immense and permanent stage that is Central Park. On Sunday, the main road is closed to traffic, and stressed the urgency that run every week on the streets of the financial district, the barter suit and ties for the jogging outfit. A bulimic fleet of speed and vitamin regime sweeping the tarmac Central Park skating, tricycle, biking ... not to mention special profiled running strollers, model designed to give the bottle without stopping , sometimes perilous attempts a young woman while manipulating a pair of dumbbells. Slower, the horse-drawn cars: The promenade is ideal for wedding declarations. Here reigns the strangest individuals. "Wild" for example, which organizes tours to discover the schoolchildren Beaver colony (some stray on 5th Avenue ...) He shows them edible plants while mimicking life insects. At home, her freezer is filled with fruits of her harvest. He claims to feed exclusively on what is in the perimeter of the park. The unfortunate were it to do so outraged even shopping in a public place. 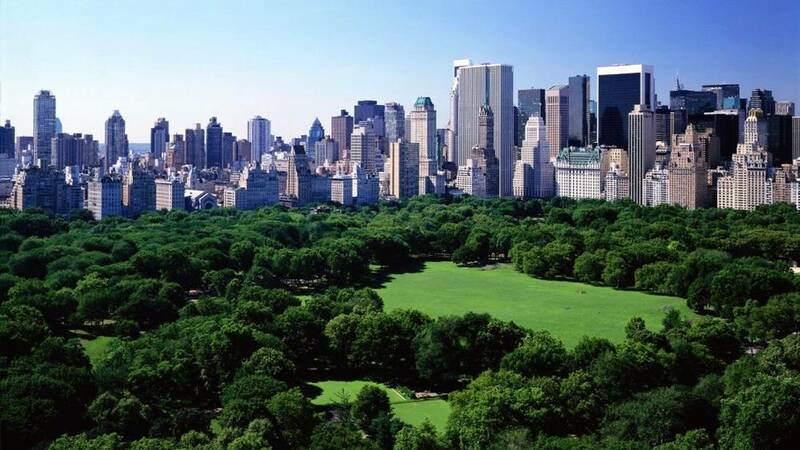 New York had a good laugh when the wild has promised not to eat while Central Park. Since then, the city decided to ignore it. Central Park welcomes about 100,000 visitors a day. 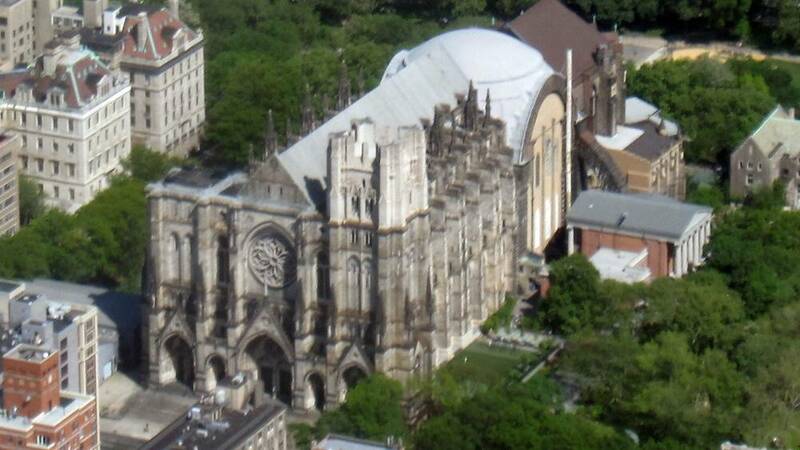 St John the Divine is the largest Gothic cathedral in the world. Neo-gothic, rather, since its construction is still in progress, although it was started in 1892. For over a century the Anglican Diocese of New York Harvest donations to complete this Medieval anthem. On the body of the building, the three arrows and hundreds of sculptures are to be invented. Even today sculptors wield hammers and chisels to carve the forms they deem fit to appear for eternity on the old stone town.